Another holiday under our belts ... literally! 🐷 Listen, here's my thinking. The world needs some of us round people for all the slim people to hide behind when the bad guys show up. You're welcome. I'm here to help. Seriously, tho, we had a wonderful time ... a beautiful sunny day, a fun Easter egg hunt, and family and friends who gathered to enjoy a delicious meal and conversation. I hope you enjoyed your weekend, too, however you spent it! Yesterday, I relaxed and got crafty in the Playhouse with Hammy. And look I pasted through a stencil! I haven't done that since last May when I was at Loll's craft retreat in Vancouver and I was instantly reminded how fun it is! I mixed Dreamweaver Pearlescent Embossing Paste with a bit of peachy Art Alchemy Sparks Butterfly Spells and passed it through a Stampendous butterfly stencil. The large schparkly butterfly was fussy-cut from a pretty piece of pp. 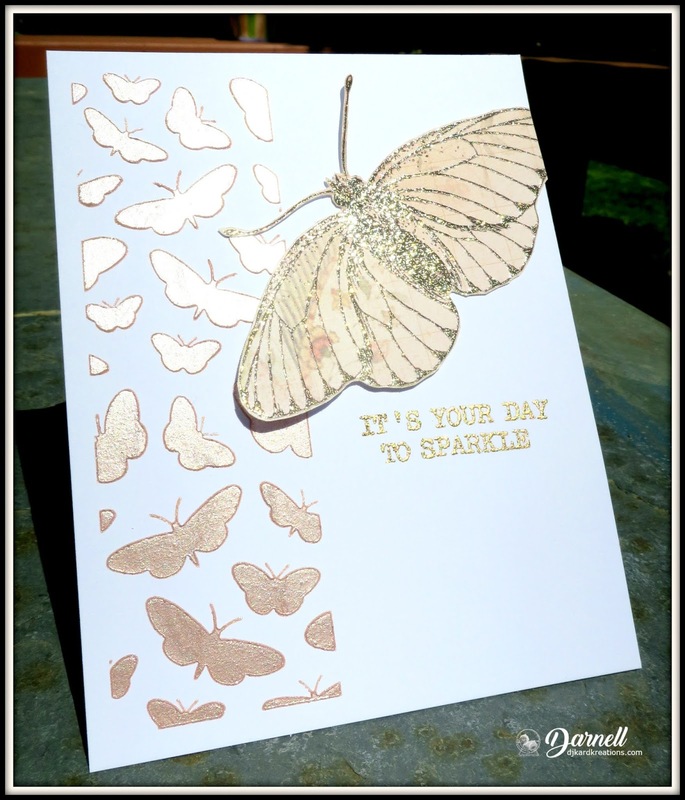 The gold glitter-embossed sediment is from Concord & 9th. Even at that, the photo doesn't do justice to the raised dimension of the butterflies. 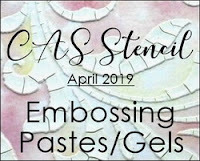 Embossing paste is super fun and the results are hugely satisfying! 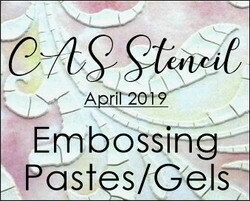 CAS Stencil: Hosted by Barb: Embossing paste/gel. Less Is More: Subtle colors. 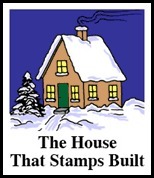 The House That Stamps Built: DCC43 ~ Use a stencil. Sorry, I should have warned you to switch over to your darker sunglasses for this bright pink Christmas card! 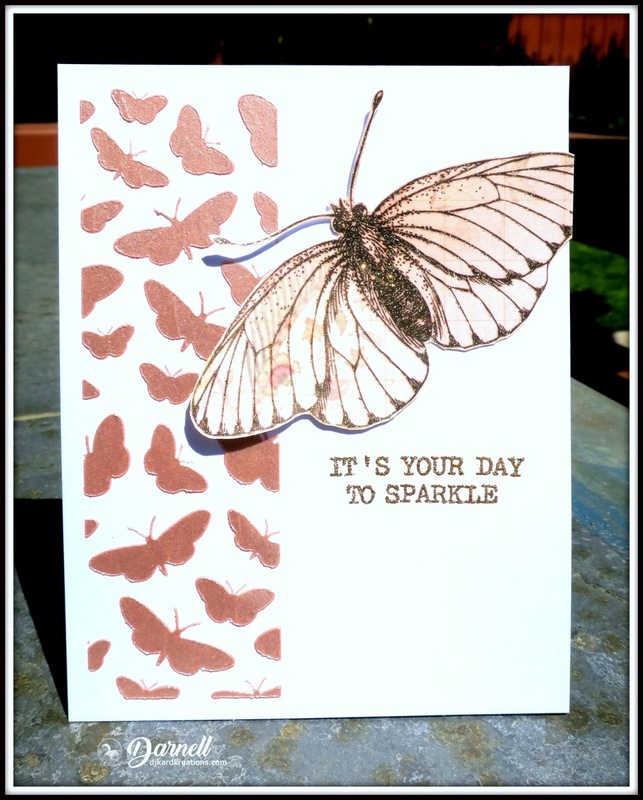 We begin with a textured card base embossed with Swiss dots*. The two pink frames are from Impression Obsession. The banner and sediment and striped pp are from PTI. 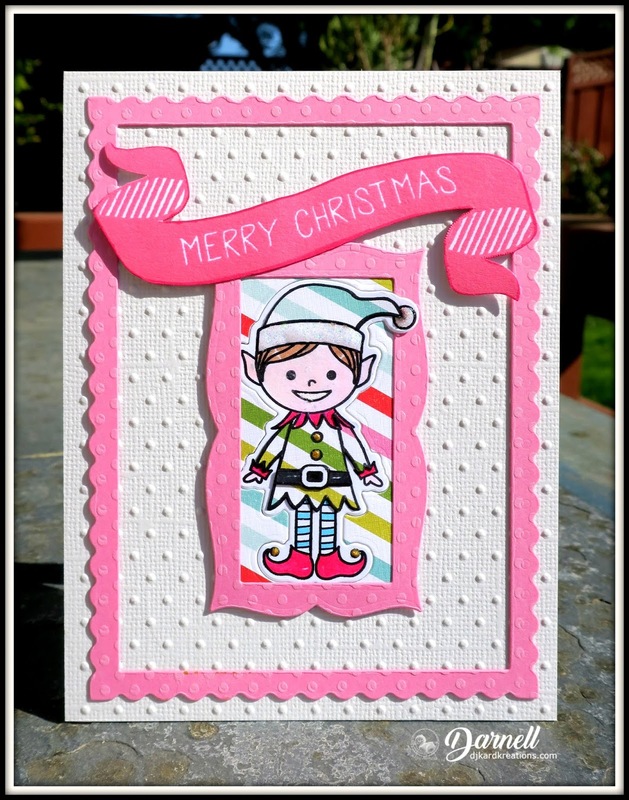 The elf from Hero Arts was cut once from white card and stamped and then cut again from the striped paper. Then the tunic and hat were paper-pieced from the striped paper. All the other areas of the elf were then colored with Ziggies and the elf was set back into the die cut. As a final touch, Hammy glittered the hat brim and puff ball with snow. 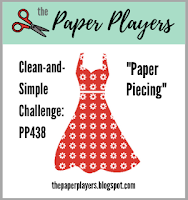 *Paper style mimics fabric of the same name. The design is said to have originated around 1750 in St. Gallen, Switzerland, which emerged as a textile center in the 15th century. Cardz 4 Galz: Pretty papers. 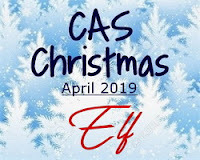 CAS Christmas Card Challenge: Hosted by Nance: Elf. 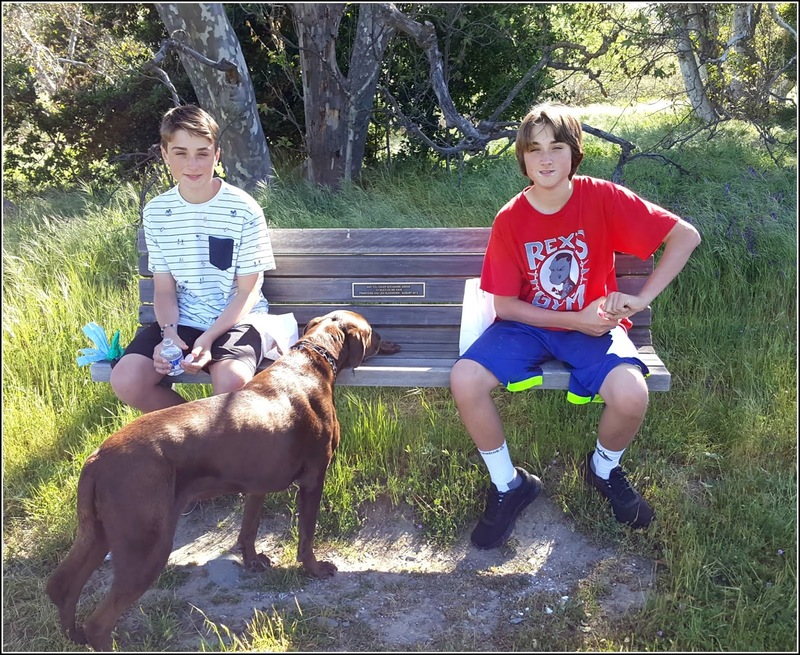 Papa and the grandtwins and Duke went on one of their local hikes. As is traditional, Papa stopped at the local Donut Wheel to get everyone donuts before driving to the trailhead. After they hiked to the trail summit, they enjoyed their donuts and Papa made them smile for a photo. You can see the remnants of their sugar donuts around their mouths ~ especially Henry's. (Can you imagine a teenage girl sitting there for a photo oblivious to sugar crumbs on her face?! 🤣) And speaking of oblivious, what really karacks me up is Duke. If you look closely, his nose is practically touching that chocolate donut left laying on the bench between the boys. Did he get it?